This delightful 5 bedroom villa is in an enviable location, close to the picturesque cove beach at Castelo. The villa boasts marvellous views over the sea and there is a mini market and choice of places to eat within a short walk. The neighbouring resorts of Albufeira and Guia and within easy reach by car, as well as a choice of great beaches, attractions and places to visit. Free air conditioning/heating in the bedrooms and pool heating is included. Villa Pine boasts a partial sea view from the first floor terrace, a spacious private swimming pool and free pool heating and air conditioning/heating in the bedrooms. Although not essential, Villa Pine has a large, private driveway which is fully gated from the road for your car should you choose to hire one. From the central hallway, there is a twin bedroom on the left and a second twin and double bedroom to the right. All 3 bedrooms share a separate bathroom. The spacious open plan living area is straight ahead and has ample seating with a dining table and chairs by the patio doors overlooking the pool. The fully equipped kitchen is to the left of the living area and is decorated in traditional dark wood with Algarvean tiling. A staircase from the hall leads to the first floor and the remaining 2 bedrooms: a double bedroom and a twin bedroom, both with en suite bathrooms and patio doors accessing a large first floor terrace with views towards the sea in the distance. The terrace can also be accessed from the landing. All bedrooms have air conditioning/heating at no extra cost. Steps from the lounge lead down to the private pool and terrace with ample space for relaxing with a book and a cool drink. The well established garden includes many flowers and a variety of bushes, trees and palms. The large covered, circular BBQ is great for cooking alfresco. The pool is heated at no extra cost. This villa has applied for a licence and the submission number is AlojLocal/2009/258. The licence number will follow. This delightful villa, next to Villa Mabelle, is close to the pretty, golden beach at Castelo, with a beach bar and restaurant. A mini market and choice of restaurants are close by, and several other lovely beaches are within easy reach by car. The popular holiday resorts of Albufeira, Praia D'Oura and Armacao de Pera are all a short drive away. 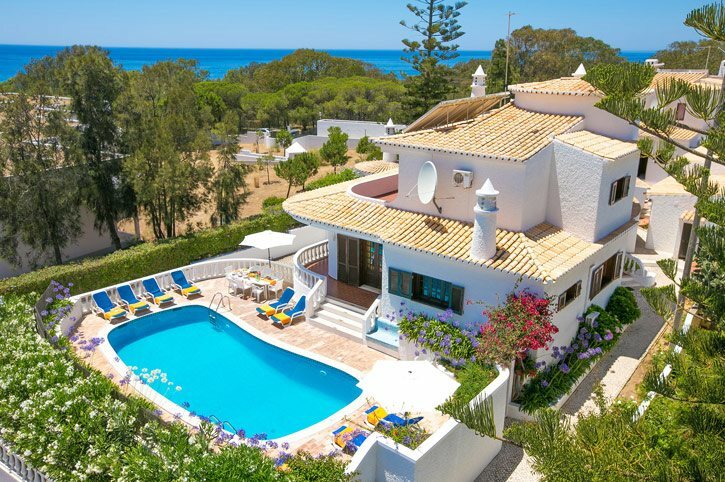 Villa Pine is located in a quiet cul-de-sac, just 300 yards from the pretty beach of Castelo, where you can also enjoy varied refreshments at the well-stocked beach bar. The adjoining cove of Evaristo with its' beach bar and restaurant is just a little further. There are several other lovely beaches along this stretch of coast, such as Coelha, Galé, São Rafael and Praia Grande, all with snack bars/restaurants, ideal for those lazy days on soaking up the sun. A mini market is 400 yards away from the villa, with a supermarket slightly further out, and numerous restaurants are in the vicinity, some within walking distance. Albufeira, the Algarve's most popular holiday resort, is 4 miles to the East, boasting an expansive sandy beach, colourful marina, and all manner of shopping amenities and restaurants. The pedestrianized Old Town has an abundance of gift shops and restaurants and is well worth a visit. A mile and half further is Praia d'Oura with its thriving nightlife scene. Guia, traditional home of spicy chicken piri-piri, is around 4 miles inland and a further mile on is the family attraction park, Zoo Marine. Four miles to the West is Armação de Pêra, a quieter resort town, which also boasts an impressive large beach. For a great family day out, there is a choice of water slide parks within a 20 minute drive. For those that like to relax with a game of golf on their Algarve villa holiday, Salgados golf course, with its lovely sea views, is a mile and half to the West of Villa Pine. Alternatively, the 9 hole Sheraton Pine Cliffs course is to the other side of Albufeira, near Olhos d'Agua. This villa is in an ideal location for a family holiday in the Algarve and for those seeking a blend of daytime relaxation and night time entertainment. For those wishing to explore the Algarve more widely, almost anywhere across the region can be reached in a maximum of an hour by car. Villa Pine is not available to book for season as it is sold out. Take a look here at the Algarve villas that are currently on sale. Having never done a villa holiday, was proved to be beyond my expectations. Thoroughly enjoyed it and would definitely do it again. Excellent company! Excellent villa, well placed for the beach but very relaxing just sitting by the pool. our villa was wonderful, spacious and clean, we found our welcome packs extremely well thought through, thankyou. a great start to our holiday. A lovely, secluded villa, ideal if you want a relaxing and restful holiday. The sea views from the bedroom terrace were gorgeous and the villa was one of the prettiest around!! Sorry but you can't improve on perfection. We loved the villa and its surroundings. It was clean, very comfortable with lots of space. The game room was nice and cool and a hit with children. Everything you could possible need was available in the villa. Outside the gardens were kept beautifully and there were plenty of flowers, an absolute joy to watch. The swimming pool was clean and large enough for all to join in. Outside was a separate laundry room with two washing machines, ironing board and iron. The barbecue stood separate from the villa and the pool in a beautiful kind of torret. All in all a wonderful holiday and we would not hesitate to book again.